Happy holiday week to everyone! It’s time for another addition of my CCC rankings by 10-year YOC. Sorry I was busy last month and wasn’t able to get this update out in time. With higher markets and some volatility, there have been some changes to the lists. Next I sorted all columns by TTM P/E and eliminated every stock with a TTM P/E over 18. I do realize this eliminates a lot of REIT’s, MLP’s, and telecom stocks. I’m ok with this since I’m not really targeting these stocks right now. Then I decided to eliminate any Champions with a 10-Year CAGR < 5%, followed by any Contenders with a 5-Year CAGR < 7 % and finally any Challengers with a 3-year CAGR < 7%. This screen eliminates a lot of slow growing companies like utilities. This last screen dropped the list of Champions, Contenders and Challengers to 15(-1), 33(-18) and 38(-3) respectively. This new round of elimination dropped the list sizes for the Champions, Contenders and Challengers to 4(-1), 10(+1) and 30 (+4) respectively. On the Champions list, there were a few changes from the last list. First, CVX, FDO and MO did not make the list this time since their stock prices have increased. We have a new company on the list, NC. NC’s latest increase in May was only 3% so this company won’t be on the list next year. With many solid companies pushing P/E’s well over 18, this list will continue to be small. There were a few new companies on the Contender’s list like DE, LMT and WEC. If you notice, I included DE since the CCC list hasn’t taken this year’s increase into account. If you didn’t notice, DE increased their dividend by 18% and I mentioned that here. The Challenger’s list added a few new companies. Additional companies now include AVX, CCE and NOV to name a few. I also left SNP on the list since they were close to making the cut. I like this list as an additional watch list. I know I posted recently a Watch list of 50 companies that I’m interested in owning at some point if the price is right. It’s more of a static list that I’ll change as I see fit. The thing is that I’m already around my target portfolio size of 40, so the majority of my purchases will be of existing positions. 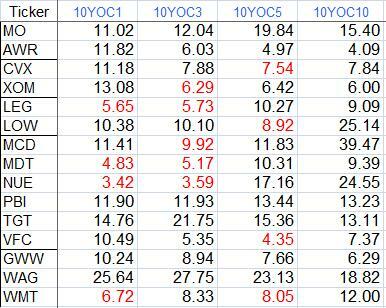 I did add a 10-year YOC column based off the 5-year CAGR to my portfolio and watch list though. 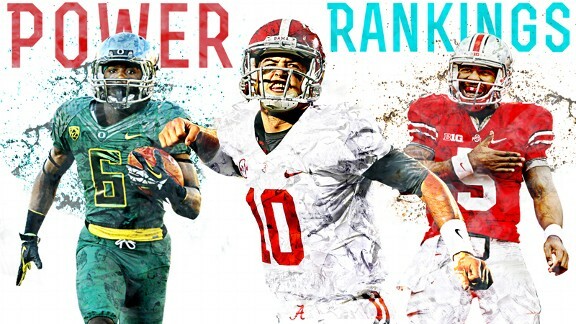 Thanks for the rankings, they are very hepful. Davids CC list ultimately convinced me to buy Walmart last month. 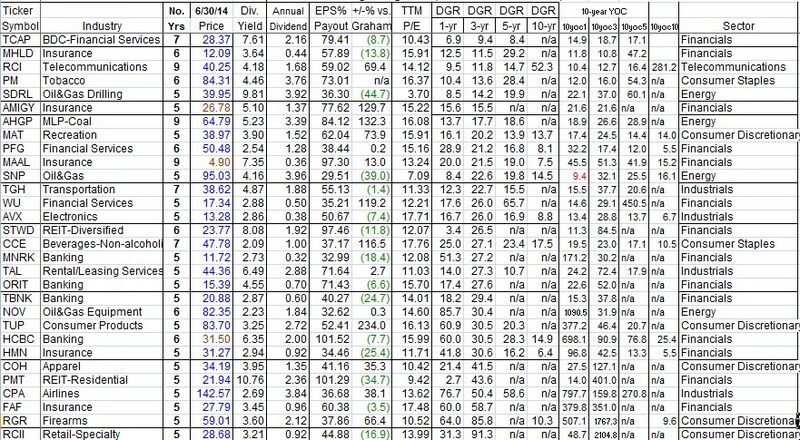 Hard not to pick certain stocks with such great track records at fair value and in some cases a premium. No problem. I’m glad you find these helpful. I think WMT looks really good here and they are also on my list. If I didn’t already have such a large position in TGT, I’d but adding them to my portfolio. Thanks for assembling this list. It’s funny how MO rarely gets any love but always seems to deliver decade after decade. I also am seriously looking to invest in the top Challenger you have listed…TCAP. Sure, I’m just glad some people find it useful. I’m pretty sure MO was on this list a few months ago. I don’t think they are cheap but I think they can keep producing more income for a long time. With their SabMiller stake and getting into E-cigs, I think they can combat the lower demand for traditional cigarettes. Of course, they have no problem raising prices on them. I’m not too familiar with how BDC’s work but TCAP does look very interesting. They sure have a high dividend yield! You are killing it on your purchases! keep it up! I always love this article. Personally I set my P/E limit at 20 instead of 18, but it’s pretty arbitrary which still makes this information incredibly useful. I just bought LMT… not too much, but I wanted some diversification as I had no aerospace. I think it’s a pretty good choice, though. With the Eagle Ford Shale going nuts, I’m interested in stocks related to that. OXY for sure, I think NOV, COP not so much. Maybe HP…. not sure. Not on the list would be EOG, XOM, CHK, BP, and several more. Heard a lot about CPA in some finance magazines recently… I might consider dipping my toe into that. Also, for PM you could make the case that it shouldn’t be a challenger. It’s not a new company, but rather a spin-off. On the one hand it’s already an established company. On the other hand it seems like comparing apples to oranges because the pre-spin-off financials were not just PM financials. Thus… the further research comment. Setting the P/E at 20 would certainly add a lot more companies to this list. I might have to adjust my P/E in this market. I’ve added to a couple of companies with over 20 p/e ‘s already this year. Those are all solid energy companies that you mentioned. I own a decent size chunk of COP and BP. I was really close to buying OXY last year and the price popped. I haven’t given it another look but I should really do that. HP looks very interesting, and if I wasn’t already invested in another driller, ESV, I would have bought that one already. I don’t know anything about COPA so I’ll have to take a peek at that one. I completely agree with you on PM. However, I’m just going off of the CCC sheets. I think PM is still at a decent value right now. They pay a great dividend and I love the international exposure. I am unable to for the lists at the bottom of the article. click to enlarge does not work. I’m not sure why that doesn’t work now. Well if you’d like, you can right-click and save the picture as a file and then open it with whatever viewer you’d like so you can enlarge it.